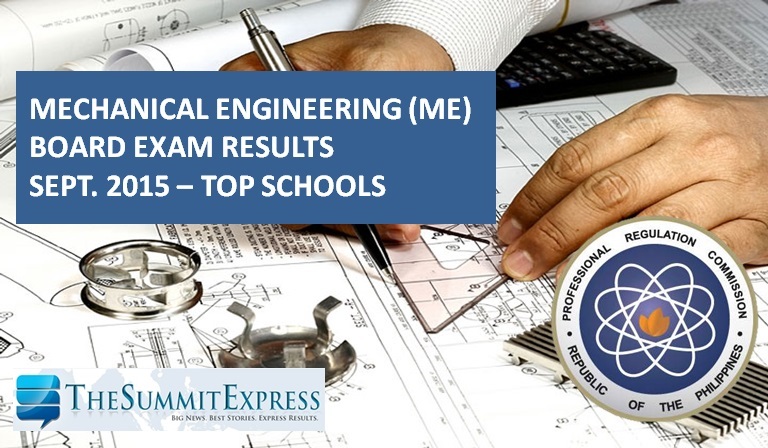 The Professional Regulation Commission (PRC) officially announced on Friday, October 9, 2015 that 2,136 out of 3,866 (55.25%) passed the Mechanical Engineer board exam and 24 out of 51 passed the Certified Plant Mechanic (CPM) Licensure Examination given by the Board of Mechanical Engineering in Manila, Cebu and Davao last September 2015. PRC named University of the Philippines (UP) - Diliman as the top performing school as per Commission Resolution No. 2010-547 series of 2010. UPD got 57 out of 59 or 96.61 who have passed the 2-day licensure exam. Batangas State University (BatSU), Technological University of the Philippines (TUP) - Manila and Saint Louis University (SLU) ranked second to fourth respectively.